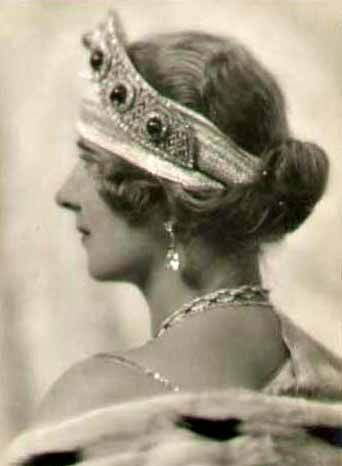 One of the most easily-recognizable tiara styles from the late nineteenth century is the kokoshnik. 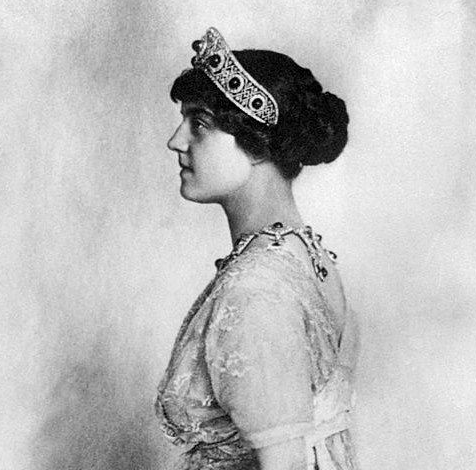 The halo-shaped tiaras were designed to mimic the headdresses worn by Russian women, and accordingly, they were popularized by the women of the Romanov court. Today's striking diamond and emerald kokoshnik started off in imperial Russia, but the upheavals of 20th century history led it on a very interesting journey. The lovely cabochon emeralds that formed the centerpiece of the tiara originally belonged to Grand Duchess Elizabeth Feodorovna (née Princess Ella of Hesse), who was the sister of Tsarina Alexandra. 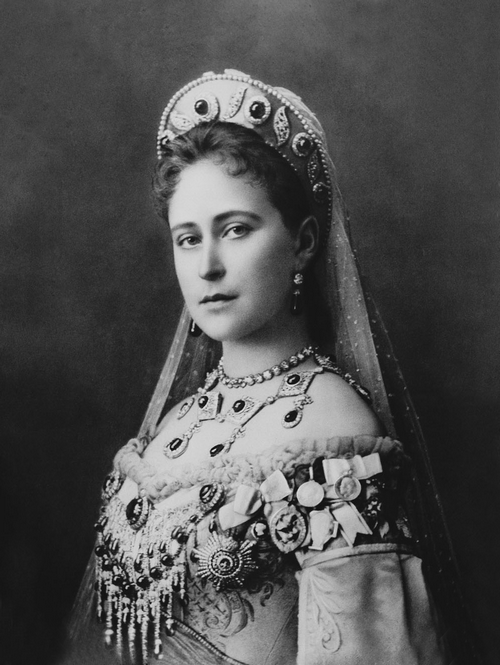 The gemstones were presented to Ella by her mother-in-law, Tsarina Maria Alexandrovna of Russia, as a wedding gift. The gems were part a complete parure of jewels, which you can see Ella wearing above. The set included a kokoshnik, an elaborate necklace, earrings, and an impressive stomacher. 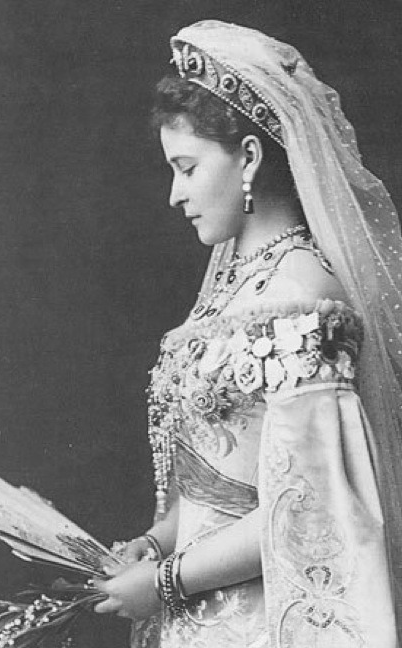 You'll note, though, that the kokoshnik Ella wears in photographs is quite different from the tiara as we know it today. At some point, the tiara was modified. The piece is attributed to Bolin; I'm not sure if it was originally made by Bolin and then later remodeled (by Bolin or another jeweler), or just remodeled by Bolin. 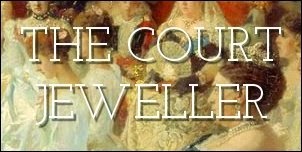 Either way, the Russian court jeweler is said to have played a part in the kokoshnik's construction at some point. In 1908, Ella gave the emerald set as a wedding present to her niece (and de facto adopted daughter), Grand Duchess Maria Pavlovna, who wed Prince Wilhelm of Sweden. Maria Pavlovna was always called “the Younger” to distinguish her from the other Grand Duchess Maria Pavlovna (the one who was the first owner of the Vladimir tiara). And then what happened to the Romanovs happened, and MP the Younger ended up in exile in Romania, where she decided to sell the tiara. But then things got bad for the royal family in Yugoslavia, too. King Alexander was assassinated in 1934, and Mignon’s young son, Peter, became King Peter II. He was then deposed during World War II, and the entire family went into exile. In 1953, was Mignon’s turn to sell the tiara. This time, the buyer was Van Cleef and Arpels. In a move that recalled their earlier treatment of the emerald tiara of Empress Marie Louise of France, the jewelry house removed the valuable Romanov emeralds, sold them to an unknown buyer and replaced them with paste. One more Serbian princess got the chance to wear the tiara after the emeralds were removed; Van Cleef loaned the kokoshnik to Princess Elizabeth, daughter of Prince Paul and Princess Olga. And you'll sometimes see the tiara — but sadly not the emeralds — on display today, as VC&A occasionally also loans it out to various exhibitions.